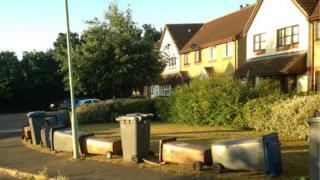 Residents blocked green spaces with wheelie bins and cars amid reports of travellers descending on a town. Caravans were already in Kesgrave, Suffolk, when word spread on social media 100 more travellers were set to join the unauthorised Grange Farm camp. A Gypsy Council spokeswoman called the blockades "pathetic" and "shameful". Despite the reports, five children and their families attended Holy Family Church for a normal daily Mass on Friday morning. Police said they put a "small presence" in the area after reports of "community tension", but there was no disorder. About 13 caravans first arrived on land off Ropes Drive on 15 June with more arriving over the next fortnight. But on Tuesday legal action to have them evicted was adjourned until July by a district judge to ensure all travellers on the site were aware of efforts to have them moved on. There are 185 authorised travellers pitches currently in Suffolk, but none in the Suffolk Coastal area. Rumours began on social media that more travellers were due to arrive in Kesgrave for a christening, but it was only the five children and their families attending a normal daily Mass. BBC reporter Andrew Woodger at the scene said there were only about a dozen cars there, not the many that were rumoured to be on their way. Thomas Hanrahan, one of the travellers at the Mass, said: "It's a small private affair and I'm sorry they feel that way and, if they're panicking, I can only apologise for that." Nearly 4,000 residents joined a community Facebook group to discuss the situation, with many people saying they had been monitoring green spaces overnight. One said: "06.05am. Oak Meadow all clear. Thank goodness." Another woman said: "When this is all over... lets have a Grange Farm residents BBQ/party at the millennium field ... to celebrate the residents coming together during this worrying time... everyone has shown great community spirit." Speaking about the blockades, Candy Sheridan from the Gypsy Council said: "How pathetic and how un-Christian in this day and age when people come many miles to celebrate, what sort of a response is this?" "It is shameful in this Christian world we live in that people are being berated for doing Christian activities." She blamed the county council for a lack of spaces for travellers, suggesting that residents should introduce themselves to the travellers already in Kesgrave to "immediately break down that resentment". Suffolk County Council's deputy leader Christopher Hudson told BBC Radio Suffolk he backed the action taken by residents and did not think more pitches would be available soon.